If you’re looking for a billing service, consider Salesforce Billing, part of Salesforce–the world’s leading customer relationship management (CRM) platform. Salesforce Billing is affordable, practical, and scalable, saving you stress, time and money. Salesforce solves this problem of complexity by presenting one comprehensive solution to multiple problems. These include problems with sales, productivity, service, marketing, analytics, productivity, apps, analytics, commerce, industries, and the Internet of things. Other tools might present solutions to one or two of these problems, but you’d have to find and balance multiple tools. 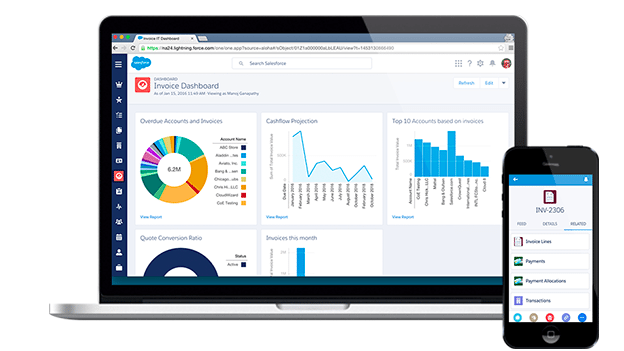 Salesforce is a one-stop solution that allows your finance, marketing, and sales teams to all use the same tool. Bonus: your COO doesn’t have to get a headache learning multiple systems. A scalable business is one that “has the potential to multiply revenue with minimal incremental cost.” In other words, as your company grows, it’s easy for Salesforce to accommodate you. The company offers its customers three free upgrades a year. Not only can Salesforce change to accommodate your business, but it also adapts to the ever-changing world of technology. Offering “developments years ahead of other companies,” Salesforce certainly holds nothing back from its customers. Its technology achievements include allowing access to their whole service via a mobile app, building artificial intelligence into their CRM service and being ranked number one by the International Data Corporation (IDC) for four years in a row. If you’re looking for a billing option, consider Salesforce Billing. It offers prices that fit companies in all stages, provides solutions conveniently all in one place, and scales with you as you grow. Contact us today to see how Salesforce Billing can serve you.